SOURCE: Allied Security Innovations, Inc.
FARMINGDALE, NJ--(Marketwire - February 4, 2010) - Allied Security Innovations, Inc. (OTCBB: ADSV), manufacturers of security products, announced that sales of ToppClip® pallet security systems have continued to grow due to increased demand for protection of palletized cargo. During the last several months of 2009 the company has seen dramatic rise in order rates for ToppClip® in answer to a world-wide demand. "This increase is an indication that our unique and patented pallet protection systems are working well," states Tony Shupin, CEO. "The ToppClip® is a sleeping giant in the industry. The one clip secures four bands eliminating easy access to the cargo. 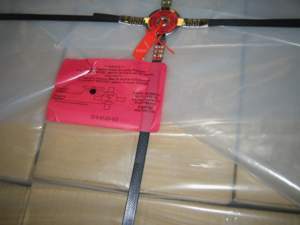 It also provides three unique identifiers to each pallet." For more information about ToppClip® and other tamper-evident security solutions, please contact Gina Uzzolino at +732-751-1044 or visit www.cgm-ast.com. Allied Security Innovations, Inc., a fully reporting company trading on the OTC-BB (ADSV) and its wholly owned subsidiary, CGM Applied Security Technologies, Inc., is a leading manufacturer and distributor of Homeland Security products, including indicative and barrier security seals, security tapes and related packaging security systems, protective security products for palletized cargo, physical security systems for tractors, trailers and containers, as well as a number of highly specialized authentication products. This Press Release contains or incorporates by reference "forward-looking statements" including certain information with respect to plans and strategies of Allied Security Innovations, Inc. For this purpose, any statements contained herein or incorporated herein by references that are not statements of historical fact may be deemed forward-looking statements. Without limiting the foregoing, the words "believes," "suggests," "anticipates," "plans," "expects," and similar expressions are intended to identify forward-looking statements. There are a number of events or actual results of ASI operations that could differ materially from those indicated by such forward-looking statements. About this company Allied Security Innovations, Inc.